Size of Male: 55-75 lbs., 25-27 in. Size of Female: 55-75 lbs., 23-25 in. Call it a miracle in the making, but all Black and Tan Coonhound puppies are actually born black! The tan markings you get to see in all adults don’t come out until the pooches turn a few weeks old. The breed is by far a darling to be with: undemanding indoors and lively outdoors. Some people say that you can tell this American coonhound breed by the way it bays and howls. Records unanimously describe this coonhound as an all-American breed, but its progenitors might surprise you. There are speculations that this dog breed originated from England’s 11th-century Talbot hound and bloodhound, as well as Virginia, USA’s Foxhound. The pooches assisted their Indian masters in trailing raccoons, opossums and mammals. Later in the early 18th century, the breed was distinguished from the American Foxhounds. Black and Tan’s are renowned today for their outstanding hunting skills. With the exception of the well trained ones, Black and Tan’s are so hardwired for hunting that you cannot really trust them off-leash. They will chase moving objects and won’t spare your friendly feline friends from the ordeal. If it’s any consolation, most of these dogs are moderately good natured indoors and around fellow canines. Living Environment – The Black and Tan Coonhound’s hunting instincts necessitate that you give them access to an amply spaced and well secured yard. Black and Tan’s can take off once a trail interests them. They also fare well in a countryside home where their loud bays won’t cause a ruckus. Grooming – This dog breed is an average shedder, requiring no more than occasional brushing. You must be prepared to put up with the “houndy” smell though…and they drool a lot! To minimize the odor, consider wiping the saliva off your pet’s mouth after a rigorous day out or after a hearty meal. Diet & Exercise – According to experts, the early breed thrived on high doses of vegetable oil and grain. It’s often recommended that you mix their ration of beef or turkey with some rice or corn. Fish and mutton are to be avoided. Vigorous play and regular exercise are some of the things that make the Black and Tan tick. If you’re considering raising one, make sure you have the time and the space to allow your pet to enjoy an active lifestyle. Hiking, jogging and trailing top this coonhound’s favorites. Health – Hip and eye tests are suggested for this dog breed. Cataracts, chronic heart disease and bleeding disorders may be occasionally seen, but overall, the boisterous and lively Black and Tan can live past one decade! 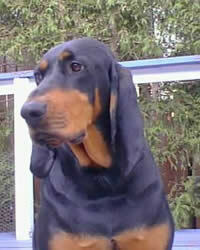 You will need plenty of expertise and also some luck in training a Black and Tan Coonhound. The breed is one of the most challenging to handle! There are at least four keys to a successful dog training session with the pooch: recall, obedience, socialization and fairness. Handle right, you will see it shine in the areas of agility, hunting and tracking.